On Thursday, December 4, Lawrence English will speak of his artistic practice at FBAUP, in Porto and, later on the same day, he will perform at Passos Manuel. 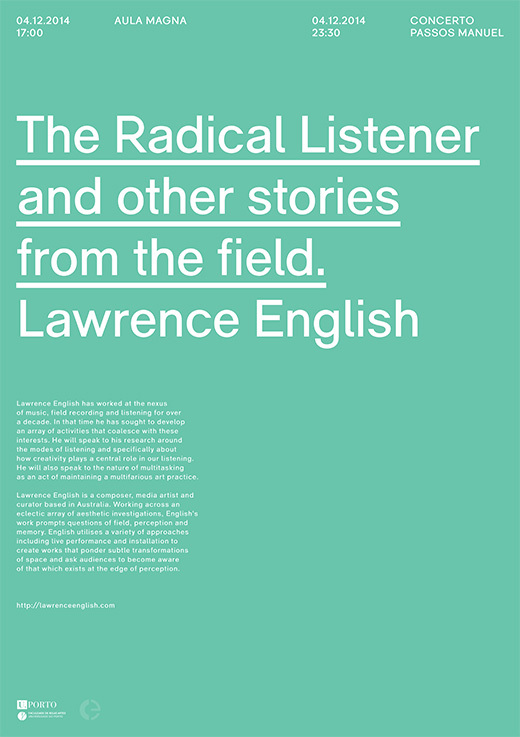 Lawrence English has worked at the nexus of music, field recording and listening for over a decade. In that time he has sought to develop an array of activities that coalesce with these interests. He will speak to his research around the modes of listening and specifically about how creativity plays a central role in our listening. He will also speak to the nature of multitasking as an act of maintaining a multifarious art practice. The talk will start at 17h at FBAUP, the performance at 23h30 at Passos Manuel. This entry was posted in Artists, Live, News and tagged Lawrence English. Bookmark the permalink. Comments are closed, but you can leave a trackback: Trackback URL.